The present coverage analysis regarding Wines of Germany indicates a significant rise of about 28.7% from the previous year. “The digital strategy over the past couple of years is paying off. Public attention to our wines is steadily growing”, says Frank Schulz, head of communications at Wines of Germany (DWI). “The findings of the analysis reflect the outstanding commitment to quality by the whole wine economy, without whose success we would not be able to communicate effectively”. 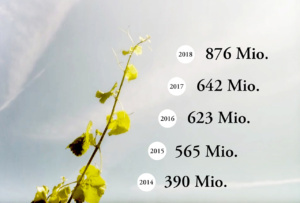 Considered separately, the figures show that the proportion of Wines of Germany’s online publications rose to 59% (previous year 53%) of total coverage in 2018 when compared to the share of printed media. The overall circulation of Wines of Germany’s publications stands at 876 million single copies meanwhile (see photo). Increased online coverage and increased attention to online content about wines produced in the thirteen German wine-growing regions have lately been proven by a Google trend analysis (dpa). Results show that the number of search inquiries for leading grape varieties such as Riesling or Spätburgunder (Pinot Noir) has been rising steadily for about a decade throughout the world. Communicating effectively is vital for companies when it comes to facing today’s fierce competition on the market. Communication activities of Wines of Germany (DWI) are based on a multichannel strategy comprising continuing media work, recommendation marketing and global networking. Besides its German headquarters in Bodenheim near Mainz, Wines of Germany (DWI) operates information offices in important export markets, the number of foreign offices having risen to fourteen with the newest office opened in Russia on November 2018.